St Thomas More was always honest, kind and caring. His Christian faith was so important to him that he died rather than give it up. He had many gifts, including a great sense of humour and he enjoyed making people laugh. Thomas was good at speaking and listening and was a great debator. His talent as a writer shone through in the many history and poetry books he wrote. He was born in 1478. His father, Sir John More, was a well known lawyer and his mother's maiden name was Agnes Granger. The family lived in Cheapside, London. When he was eight years old, Thomas went to St Anthony's School in Threadneedle Street, where he learnt Latin. Thomas enjoyed his school and achieved well. As a twelve year old, he was page boy to Cardinal Morton. Thomas went to university in Oxford when he was fourteen and in 1498 he became a law student. In 1505 Thomas married a lady named Jane Colt and they had four children: Margaret, Elizabeth, Cecily and John. Sadly, Jane died and Thomas married again. His family grew after he adopted several children. Thomas was a great animal lover and he owned many unusual animals, such as: monkeys, a fox, a weasel, a beaver and many rabbits. As a successful young lawyer, Thomas became part of King Henry VIII's court. 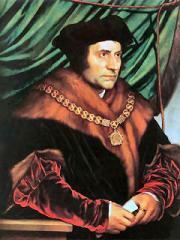 In 1520 Thomas was knighted by the King and became Sir Thomas More. He was a good friend of the King who would often visit Thomas' house in Chelsea, where they would discuss Greek, theology or astronomy. The King respected Sir Thomas's wisdom and made him Lord Chancellor in 1529. In 1532, Sir Thomas resigned as Lord Chancellor because King Henry VIII was made head of the Church of England, an appointment Thomas did not agree with. Two years later, Thomas was sent to the Tower of London because he would not accept that the King was head of the church. Sir Thomas was sentenced to death for disagreeing with the King, and beheaded on 6th July 1535. Before he died, Sir Thomas said, "I am the King's good servant but God's first". God chose Joseph a young carpenter of Nazareth to be the foster father of Jesus and the husband of the Blessed Virgin Mary. After they were engaged to be married an angel appeared to Joseph in a dream and told him that Mary would give birth to a Child who would be the Son of God. Saint Faustina was a Polish nun who saw Jesus and received messages from him. Jesus wanted her to tell the world that He is the Divine Mercy. Saint Faustina was born on the 28th of August 1905 in Poland and was baptised Helena Kowalska. She was the third of ten children. Her family lived on a farm. They were poor but very religious. At the age of seven Faustina thought God was calling her to be a nun. She went to school for three years when she was twelve years old and was always good to the poor. In 1924 she was told by Jesus to leave for Warsaw and join a convent where she became a Sister of Our Lady of Mercy and was known as Sister Maria Faustina of the Blessed Sacrament. In the convent she worked in the kitchen and looked after the garden. Sometime later, Jesus spoke to her again: "The pale ray stands for water, the red ray stands for blood." She wrote that Jesus explained to her that God loves us all and He wants us to recognise His mercy and allow it to flow through us to others. St Faustina died on the 5th October 1938 and was canonised on the 30th April 2000. Just before she died she told the sisters not to be unhappy after her death because she would send a shower of roses and spend her heaven doing good on earth. She died in 1897. Bernadette was born in 1844 in Lourdes, in France. Bernadette was often sick she suffered from asthma. Her family were very poor. Whilst gathering firewood, a beautiful lady appeared to her in a cave. Bernadette saw the lady eighteen times. The lady asked her to dig a little hole in the ground and to wash her face. Suddenly a spring started to flow. Later Bernadette became a nun. She died at the age of thirty six in 1879. Vincent was born in France in 1581. As a young priest pirates captured him and sold him into slavery. He converted his master and was set free. Vincent went to Paris where he organised groups to look after the poor. Vincent built homes for the poor, the sick, the aged and abandoned children. He also founded the Daughters of Charity with their help he was able to clothe and feed the poor and nurse the sick. Vincent died in 1660. The Saint Vincent de Paul Society continues his work for the poor. Dominic was born on the 8th August 1170 into a wealthy family who lived in Spain. He went to school and studied the arts and theology. As a young man he gave away his money and sold all his belongings to feed the hungry. Dominic went with a Bishop to southern France where many people were leaving the Church to follow a false teaching. Dominic decided to remain in France and devoted his life to preaching and leading people back to the Faith. He always slept on the floor and often walked barefoot however sharp the thorns or stones. In 1208 Our Lady appeared to Dominic with a beautiful wreath of roses. She asked him to say the Rosary every day and to teach the people to pray the Rosary. Dominic went to Rome and informed the Pope that he wanted to establish a religious order whose duties would include preaching and teaching. The new order was established in 1216 and was called the Order of Preachers; known today as the Dominicans. Dominic also founded an order of nuns to care for young girls. He met St Francis of Assisi in Rome and they became good friends. After a short illness Dominic died in 1221 aged 56 years old. Lucy was born in 283 into a rich family. Her Father died while she was young. Her Mother was ill for four years. Lucy persuaded her Mother to go to the tomb of St Agatha where they prayed all night and fell asleep exhausted. Saint Agatha appeared in a vision to Lucy and at that point her mother was cured. A rich young man wanted to marry Lucy but because she had offered herself to God she refused. He was so angry at her refusal that he told the governor she was a Christian and she was led to the city for trial. She told the governor "I will never sin, so that the Holy Spirit will give me a greater reward. You see now that I am the temple of the Holy Spirit, and that He protects me." The governor ordered a fire to be lit around her, but Lucy was not harmed. At last, a sword was thrust into her heart. She did not die until a priest came to her with Holy Communion. St Lucy is the patron saint for people who have trouble with their eyes. On the 15th August 1928 Agnes went on pilgrimage to the Shrine of the Black Madonna. While she was praying she knew that God was calling her to be a nun and look after the poor. She joined the convent of the Sisters of Our Lady of Loreto in Ireland and received the name Teresa, after her patroness St Therese of Lisieux. She trained as a teacher and became principal of a high school in Calcutta in India. While she was there she was horrified by the sight of so many sick and dying people on the streets. She knew that it was wrong and she was determined to do something about it although she didn’t really know what at first. In 1946 she was travelling to Darjeeling by train as she prayed the Rosary, Jesus spoke to her, ‘I thirst and I want you, to serve me in the poorest of the poor. ‘His message was clear and she decided to leave the convent and help the poor by living among them. People came to help Mother Teresa in her work and eventually she had so many helpers they became a new order called the Missionaries of Charity. No-one was turned away and the sisters vowed not to own possessions or have wealth of their own, but to give everything they had to the poor. On the 5th September 1997 Mother Teresa went home to Jesus. Pope John Paul II beatified Mother Teresa and on the 4th September 2016 Pope Francis canonised her, declaring her a Saint. St Patrick was born in Scotland in the year 387. At sixteen he was captured by pirates and sold as a slave to a chief in Ireland. While tending sheep in the mountains he prayed constantly. After six years, a voice from heaven told him to go back to his own country. But first he want to Rome, where he became a priest. He was then sent to England where he worked for the Church, he wanted, however, to return to Ireland, and he begged the Pope to send him there. The Pope made him a bishop and then sent him as a missionary to Ireland. One of the pagan kings of Ireland arrested Patrick. When he saw the miracles worked by Patrick, he said, "Tell us about your God. He has given you great power." "There is one God," answered Patrick, "and three Persons: the Father, the Son and the Holy Spirit." Picking up a green shamrock he said, "Even as there are three leaves on this one stern, so there are three Persons in God." He was allowed to preach the new Faith everywhere in Ireland. Catherine was the youngest of a very large family, she had twenty three brothers and sisters. At the age of six she had a vision in Church in which Jesus appeared to her and blessed her. She felt that Jesus wanted her to give her whole life to him. Catherine's parents wanted her to marry so she had her hair cut off and became a Sister instead, joined the Sisters of the Third Order of St Dominic. She took care of the poor and the sick, nursing people no-one else wanted to care for and spent a lot of time in prayer. Catherine made a special visit to Pope Gregory XI and told him that God wanted him to live in Rome not France. The Pope listened to her because she was very wise and did go back to Rome. Catherine became very sick and three months later died in 1380 aged thirty three. In 1975 Catherine, who had never gone to school (she only learnt to read and write shortly before she died), was declared a Doctor of the Church. This is a title for someone who was outstanding in teaching and guiding the Church. St Catherine is the Patron Saint of Nurses. He was on his way to Damascus to arrest some Christians when a light from heaven suddenly shone around him. He fell to the ground. He had been struck blind. He heard a voice saying "Saul, Saul, why do you persecute me?" He asked, "Who are you?" and the voice answered, "I am Jesus, whom you are persecuting." Saul asked, "Lord, what do you want me to do?" The voice said, "Go into the city; you will be told what to do." Saul had to be led by his companions into the city. After three days, a man named Ananias came to him and said, "Brother Saul, the Lord has sent me that you may get your sight back and be filled with the Holy Spirit." At once Saul could see. He was baptised and was called Paul. He began to preach the word of Jesus and wrote many letters to the Christians. Paul travelled and preached for years. He died in Rome in the year 67. Anthony was a great preacher. He was send out as a missionary and preached in many cities in Italy and France. He brought sinners back to God mostly by his good example. One day, when Anthony was praying in his room, the Infant Jesus appeared to him, put His little arms around his neck, and kissed him. This wonderful favour was given to him because he loved Jesus very much.